The TRAILBLAZERS series highlights the intersectional identities of activists and changemakers in the gender-based violence and domestic/sexual violence prevention movements. For Sexual Assault Awareness Month, we worked with No More to highlight activists working to end sexual violence. This month we’re so excited to introduce our first student activist in the TRAILBLAZERS series. Jake Comito is the founder and president of the nation's largest student-run NO MORE chapter, which is at Rutgers University. Not only does Jake spend his time working to change the culture around sexual violence at his school, he is also a leader on-campus. Jake is an Apartment Assistant to 60 student residents, a Teaching Fellow for a marketing course, a referee for Intramural Sports and a member and advisor to a handful of sexual violence committees. 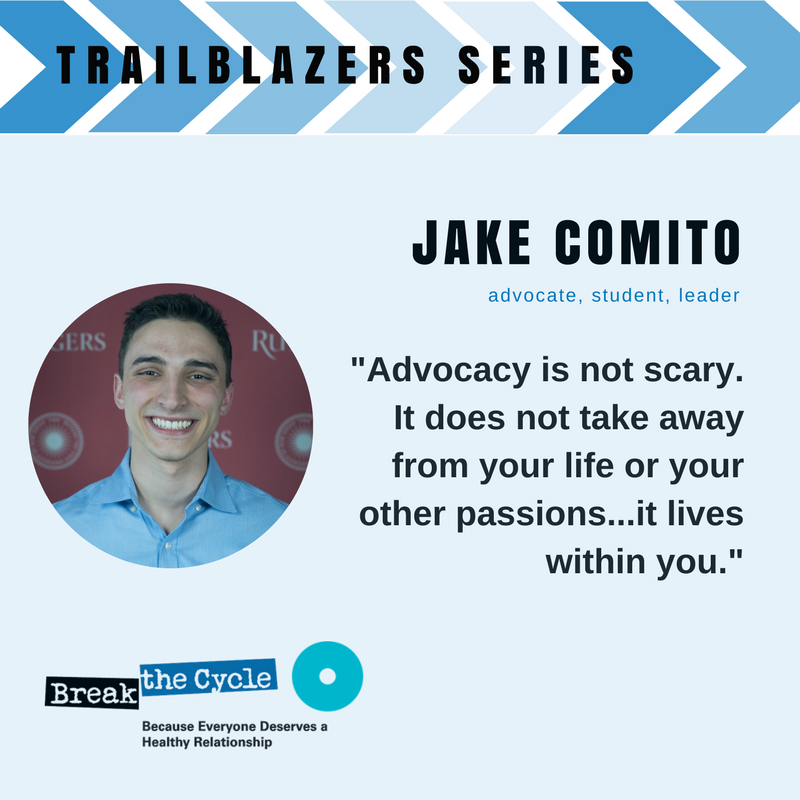 Last spring, Jake was identified as one of Rutgers' top leaders for his prioritization of sexual violence in his varied roles, and his ability to galvanize other students into action. He will finish out his final year at school studying marketing in the Rutgers Business School before joining the Commercial Emerging Leaders Program, at Nielsen. Jake also plans to continue to say NO MORE with the national campaign as much as he can. As part of our TRAILBLAZERS series, we will ask featured activists to answer a few questions for us about their experiences in the movement. Why did you initially get involved with the Gender-Based Violence Movement or Domestic Violence/Sexual Assault prevention? I became involved in the movement against gender-based violence through my University. I was hired to be a Resident Assistant on-campus, and RA's were required to undergo sexual assault and domestic violence trainings and response tactics. I knew little about these topics beforehand, but I quickly learned how serious, complex and traumatic sexual assault and dating violence could be. Learning is a lot different than experiencing, though. Listening to professionals and completing modules were far less striking than responding to situations in the halls. Although I knew the statistics, and although I listened to stories from other Resident Assistant's, I was still incredulous to address so many situations my first year. I wanted to raise awareness on the uninformed, uneducated and boundlessly damaging remarks associated with sexual violence. Students would often trifle with these situations, treating them with less seriousness or respect than other crimes. It was confusing to me. So I brought the NO MORE campaign to my hall, and then my staff and then my campus until NO MORE was something buzzing in everyone's ear, especially when they heard and experienced these crimes themselves. Based on your own intersecting identities and the experiences that come with that, what do you see as some of 1) the greatest accomplishments of your campaign so far and 2) the challenges that it still faces? The Rutgers NO MORE campaign blew up after an article was published in my school newspaper, and after I published an editorial on the national NO MORE campaign's website. My face, and the face of my classmates, were on the front page, commended for our efforts to address sexual violence as students, among students. I received overwhelming support from nearly everyone. But there were definitely a few naysayers who did not believe that a man could lead a campaign against sexual violence. And although that initial heat simmered, there are definitely still challenges to include the entire population in this movement. The Rutgers NO MORE campaign takes pictures of students pledging to say NO MORE to stereotypical phrases associated with sexual violence, such as, "Well, she was drunk" and "It was just a misunderstanding;" out of our nearly 1,000 photos, I assume that only about 1/4th of them are of men. But a lot of men have spoken out against gender-based violence on-campus. For example, two of our major male candidates for student-body president are active members of the Rutgers NO MORE club. Another man created an app to walk students to and from parties late at night in hopes to circumvent instances of sexual violence. And more and more men, including fraternity members and athletes, continue to pledge their allegiances to our cause, and continue to partake in our conversations. I believe that men are an important part of this conversation because this is truly an issue that affects anyone, and it is truly a topic that anyone, and everyone, can support. What specific message do you want to send to young people about what you hope they will accomplish in the next phase of the movement? I want to tell young people that advocacy is not scary. It does not take away from your life or your other passions, and it does not label you or subject you to criticism. Advocacy, especially sexual violence advocacy, lives within many people. So many people feel the same way, and so many people want to say the same things. It takes courage to be the first one in a group to bring up difficult conversations because it definitely is difficult and uncomfortable. But that uncomfortable feeling dissipates the moment you realize that someone hears you, and someone feels the same way as you. I am still a business student, a Teaching Assistant, a sport fanatic, a crazy and silly friend; but threaded through all of those intersections, and consistent through all of my groups, is someone who does not tolerate sexual violence and someone who will always speak out against it regardless of where I am, or which hat I am wearing. The choices we make every day show the world who we are and what we stand for. We love Jake’s advice that advocacy doesn’t take away from who you are or your activities - it enhances them! Protecting each other through education, awareness, and bystander intervention is how we make our country and communities great. When you use your own unique talents and personality to stand up to violence, amazing things happen - just look at Jake and Rutgers No More! Make a difference today by signing up for Let’s Be Real, the national movement by young people for young people about relationships. Together, we’ll create a culture without abuse. Stay tuned for our next TRAILBLAZERS feature!